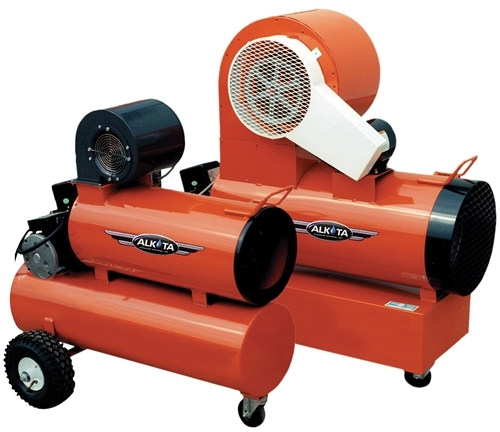 Alkota's Model 150 and 210 Space Heaters offer instantaneous circulation of heated air at low cost wherever temporary or emergency heat is necessary. The unit is designed to run on kerosene, No. 1 fuel, or premium diesel fuel and plugs into any standard grounded 110 volt outlet. These easily moved space heaters feature stainless steel cumbustion chamber, high temperature limit switch, and pneumatic ball bearing wheels and casters for long life and ease of use. Portable diesel oil fired space heater. Fuel Capacity 14.5 gal. 15 gal. Fuel/hrs. 14.5 hrs. 7.5 hrs. Dimensions H-39", L-40", W-22" H-47", L-42", W-21"
Weight 150 lbs. 215 lbs.